In honor of National Pizza Party Day, I decided to throw my favorite kind of party: A Disney princess themed party! Pulling inspiration from a few of my favorite Disney princesses, I created personal sizes pizzas inspired by them! They are so colorful, the pizzas are enough for their own decoration for your party. To throw your own Princess Pizza Party, you can either pre-make the pizzas, or have a variety of colorful chopped veggies out for guests to create their own one-of-a-kind princess pizza creations! Preheat your oven to 425 degrees F. Top your crust with oil, cheese, and other toppings, and bake for 15 minutes. Preheat your oven to 425 degrees F. Top your crust with oil, cheese, and other toppings, and bake for 11 minutes. I have to give a shout out to my talented husband Garrett, @garrettmakesart on Instagram, for drawing the adorable princess pizza illustrations! 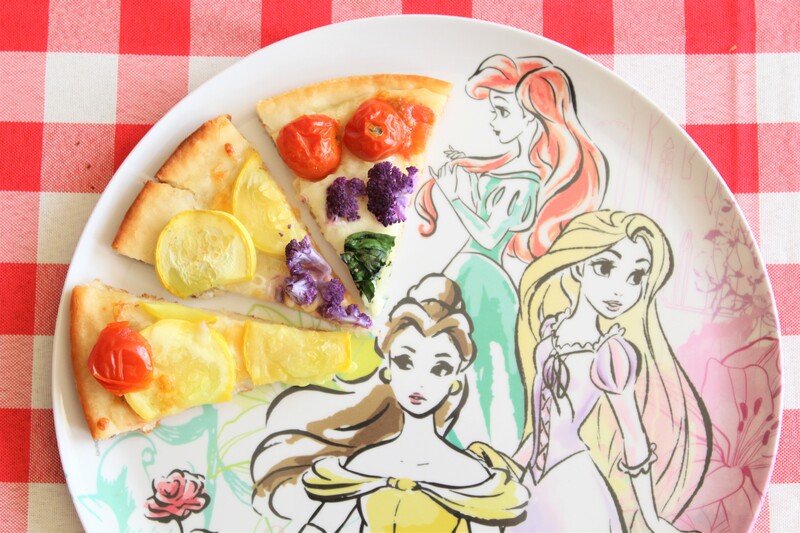 Have a royal time celebrating National Pizza Party day with these princess pizza inspirations! I would love to hear about what princess you would draw inspiration from to create a personal princess pizza for yourself! A Mickey Mouse + Eggo Waffle Breakfast Birthday Party!